NASA's MarsExploration Rover Spirit mysteriously rebooted its computer twice over theweekend; mission controllers are examining data sent back by Spirit to see ifthey can diagnose the problem behind the glitch. "Whilewe don?t have an explanation yet, we do know that Spirit?s batteriesare charged, the solar arrays are producing energy and temperatures arewell within allowable ranges. We have time to respond carefully and investigatethis thoroughly," said Spiritproject manager John Callas of NASA?s Jet Propulsion Laboratory, Pasadena, Calif. "The rover is in a stable operations state called automode and takingcare of itself. It could stay in this stable mode for some time if necessarywhile we diagnose the problem." Spiritcommunicated with controllers Friday, Saturday and Sunday, but some of thecommunication sessions were irregular. One of the computer resets apparentlycoincided in timing with operation of the rover?s high-gain dish antenna. Fortunately,the high-gain antenna isn't the only communication option with Spirit; therover can also communicate at a slower data rate, through a low-gain antennathat does not move. Additionally, communications can be relayed by Marsorbiters, using the UHF (ultra-high frequency) transceiver, a separate radiosystem on the rover. "Toavoid potential problems using the pointable antenna, we might consider for thetime being just communicating by UHF relay or using the low-gain antenna,"Callas said. Spirit, andits rovertwin Opportunity, finished their three-month prime mission on Mars fiveyears ago and have kept operating through multiple mission extensions. The rover?sonboard software has been updated several times to add new capabilities for themission, most recently last month. The team is investigating whether theunexpected behavior in recent days could be related to the new software, butthe same software is operating on Opportunity without incident. 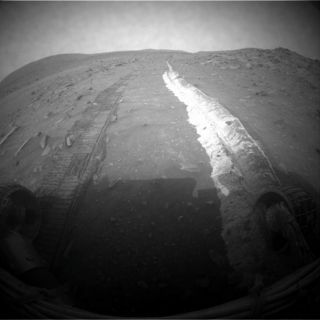 "Weare aware of the reality that we have an aging rover, and there may beage-related effects here," Callas said. In the pastfive weeks, Spirit has made 390 feet (119 meters) of progress goingcounterclockwise around a low plateau called "Home Plate" to get fromthe place where it spent the past Martian winter on the northern edge of HomePlate toward destinations of scientific interest south of the plateau. On March10, after several attempts to get past obstacles at the northeastern corner ofHome Plate, the rover team decided to switch from a clockwise route to thecounterclockwise one. Subsequentevents have included Spirit?s longest one-day drive since the rover lost use ofone of its wheels three years ago, plus detailed inspection of light-toned soilexposed by the dragging of the inoperable wheel. Meanwhile,on the other side of Mars, Opportunity has continued progress on a long-termtrek towardEndeavour Crater, a bowl 14 miles (22 kilometers) in diameter and stillabout 7 miles (12 kilometers) away. Last week,a beneficial wind removed some dust from Opportunity?s solar array, resultingin an increase by about 40 percent in the amount of electrical output from therover?s solar panels. What Lies In Store for the Mars Rovers?